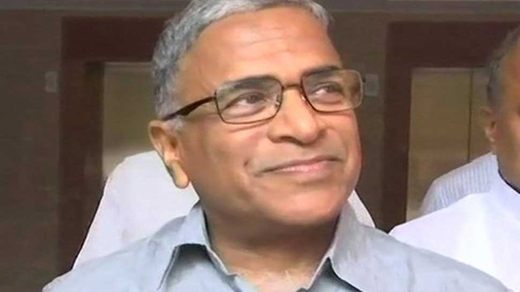 New Delhi, Aug 09, 2018 : The National Democratic Alliance’s candidate Harivansh Narayan Singh of the Janata Dal (United) was on Thursday elected as the deputy chairman of the Rajya Sabha as he defeated the joint Opposition candidate BK Hariprasad by 20 votes. The National Democratic Alliance candidate got 125 votes as against 105 of Opposition candidate BK Hariprasad. The proceedings to elect a new deputy chairperson of Rajya Sabha began with the NDA moving four motions for its candidate and the opposition moving five for Hariprasad. The position fell vacant after PJ Kurien retired in July. Prime Minister Narendra Modi, BJP leader Arun Jaitley, Congress party’s Ghulam Nabi Azad and many others congratulated Harivansh after he was elected as the Rajya Sabha deputy chairman. Much ahead of the voting, the NDA was confident of winning the post though it does not enjoy a majority in the Upper House, due to apparent division in the Opposition camp. In a major boost to the BJP-led NDA, Naveen Patnaik’s Biju Janata Dal (BJD) extended its support to Harivansh after Prime Minister Narendra Modi spoke to the Odisha Chief Mminister on the phone in the third sign in recent weeks of a new warmth in the otherwise frosty, even hostile, relationship with the BJP.